After a couple months back in the States, I grew restless again, and decided to go on a trip with my boyfriend to Mexico for three weeks. We stayed in Oaxaca for the majority of our trip and made a point to draw almost everyday, outside of taking four hours of Spanish a day. 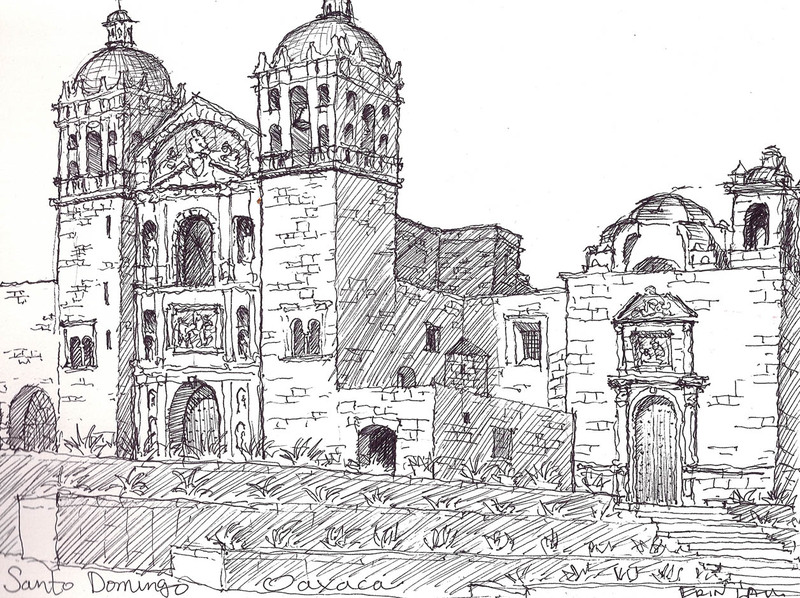 We both drew this, the beautiful, looming Templo Santo Domingo in Oaxaca, Mexico. It was only a three minute walk down the block from our homestay, and we admired it everyday. We loved how, unlike other cathedrals we saw in Mexico, this one had a raw quality about it, with chiseled greenish blue cantera stone. The plaza before it was always lively with activity, hawkers, cultural events, teenagers socializing. The amazing Ethnobotanical garden within its cloister walls completed it. ← Greeting Cards and Prints Available on Etsy!